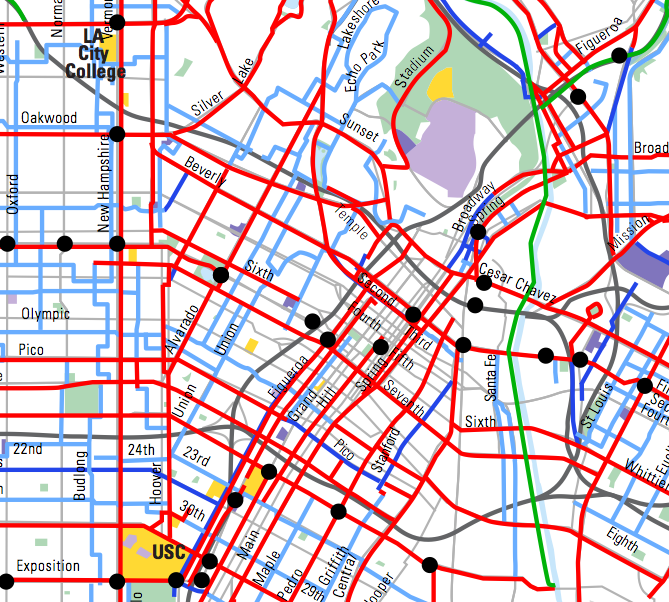 The 2010 L.A. Bike Plan envisions a robust bikeway network for the city’s Downtown core. Spring Street was an ideal candidate for bike lanes due to existing high bicycle use, and low vehicle traffic volumes. 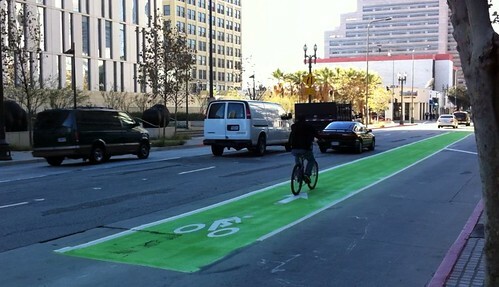 A travel lane was re-purposed in order to provide a 6′ bike lane with a 4′ painted buffer. 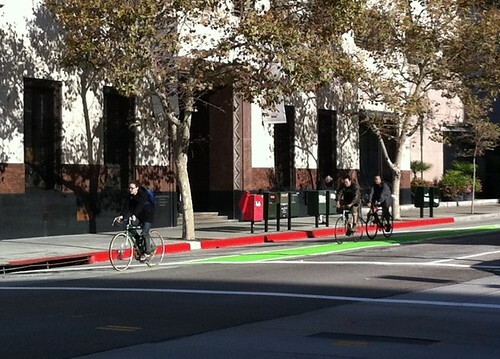 To further enhance the separation between bicycle and motor-vehicle travel lanes provided by the buffer, the Spring Street bike lanes were also greened. The buffer, along with the colorization, are intended to increase bicyclist comfort and motorist yielding behavior. At merging areas and bus zones, the solid green lanes become dashed to denote the shared space characteristics of the facility at those particular locations. In the future, Spring Street bike lanes will provide direct access to many of Downtown’s newest open space and recreational centers, including the (currently under construction) 12 acre Civic Center Park and 0.7 acre Spring Street Park. Within the next few months, LADOT will be looking to add bike lanes on Main St. to create a north-south couplet for Downtown bicycle travel. Further down the road, we will continue to build out the Downtown backbone network through the continuation of the very successful 7th St. bike lanes to Boyle Heights, in addition to bike lanes on Figueroa and Flower. Many thanks go out to the Downtown L.A. 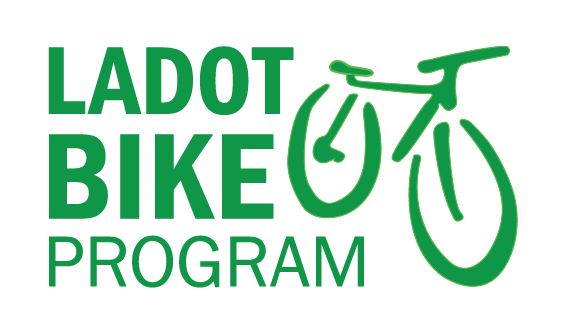 Neighborhood Council and the Los Angeles County Bicycle Coalition (LACBC) for their support of this project. Also, special thanks to the Downtown ThinkBike L.A. participants Kent Strumpell, Tonny Bosch, Hilary Norton, Jorge Mutis, Emily Duchon, Jennifer Klausner, Steve Gaur, Valerie Watson, Tim Fremaux, Lynne Goldsmith, Harden A. Carter, Richard her Avest, and Nick Marichich for dreaming big and getting the conversation started. Hearing complaints that some of the paint has already come off. We are aware of the issue. The rain may have washed some of the paint away. We will be retouching soon. Can’t wait to ride those. We have them in Long Beach, and they are great. Currently rehabilitating using the rip 60, but as soon as I can get on a bike again, I am up there. Had an opportunity to ride both the Spring St and 1st St. green bike lanes this weekend. Clearly the material used on 1st St is more durable than the already fading paint on Spring St. On the other hand, I find the Spring St. colorization of the entire lane to be much preferable to 1st St colorization only in “conflict zones”. Anywhere a cyclist rides in an unprotected lane is a potential conflict zone. To that end, while I think these efforts are a step up from striped lanes with no colorization (not to mention the ultimately useless “bike route”), I suspect they won’t encourage new cyclists. For that, we have to get serious about protected cycling lanes. The material on 1st St is Flint Tradings Premark material. It is preformed thermoplastic that is heated to the surface.